even the wealthiest among us could not imagine. After all, impressing an owner that has seen everything, is no mean feat. The philosophy of a 21st century custom tender manufacturer is whatever you want, and it is then created. As this goes to press Superyacht Tenders and Toys have 10 fully custom boats in build for clients, where they have been designed from the ground up to meet the client’s requirements with many features that push the boundaries. With this experience we have put together some of the latest trends and requests for your interest. When it becomes difficult to think of what can’t be placed in a boat you know you are headed in the right direction. With underwater lights, electric swim ladders and mega sound systems becoming a regular on the spec sheet, where do you go next? When you sit down in the office one day and start having a joke about what you might want in a tender that then turns into proposal of ideas ranging from wireless kill cords to air-conditioned seating, you start to realise what can be achieved. Matching what can actually be built and be reliable is key here but for the brainstorming there are no stupid ideas. If an interactive deck head in the cabin of a 40ft Limousine tender doesn’t impress, then it is by no means the bottom of the barrel. As the size of your average superyacht gets larger so does the size of the tenders that service them and this often allows more room for creativity, which there is no shortage of in a world where money is no object. 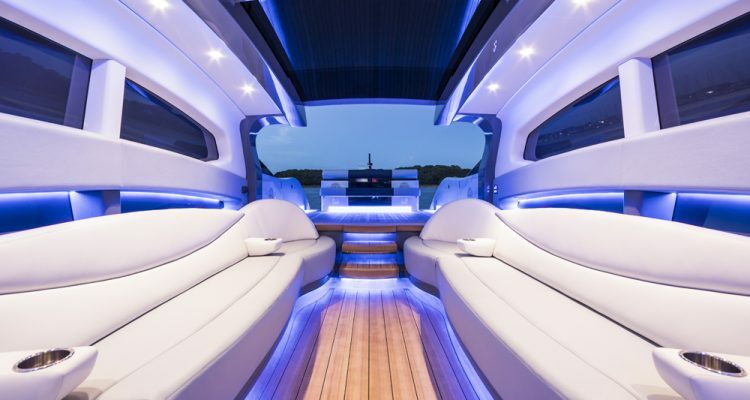 The likes of JL and Fusion creating monster speaker systems is now not only a feature in wakeboard boats but can be seen in a variety of custom tenders. One recent project had tower speakers coming up out of the hulls of a catamaran landing craft, which rotated to the beach, so the client could create a DJ booth and entertain guests on the beach for a party! With all of this obviously comes a price tag and considerations into design, fabrication and support of using emerging tech and products. As well as this, as we know, custom has a price tag and thus on the other production or semi-custom tenders we have in build full custom is not appropriate for every client. There is a lot to be said for having proven reliable technology with minimal opportunity for breakdowns and getting this balance is critical. Ventilated seats perform the opposite task of heated seats, providing three levels of cooling, rather than heating. Cool air gently circulates through perforations in the seats, keeping you cool, which is especially nice after the summer sun has been baking those black leather seats. These seats will help adjust your comfort levels quickly, so you get to your next destination without getting overheated. On previous tender projects, we have used the deck-head and roof as a design feature of the interior of the Limousine. Having an interactive screen on the walls, roof or even floor is a great feature able to change the mood and look of a tender according to the use. You can have rivers running along the floor, mountains on the walls or whatever lighting, including starry skies at night for instance. The only constraint is the designs you want to have. On previous tender projects we have built in LED lighting into the cup holder which can change colour according to the mood. Superyacht Tenders and Toys lead the way in yacht tender sales, and also project management of tenders in build, and have a wealth of knowledge into the best designers, builders, products and services to suit a clients’ budget and requirements. We are involved in ordering and managing the build process of a wide range of tenders.